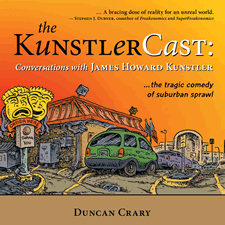 For four years, Kunstler and Crary met in person to record their ongoing conversations (totaling more than 150 hours) about suburbia, sprawl, car-dependence, cities, peak oil, American culture and many other topics for a weekly audio podcast (also called "The KunstlerCast"). Their ongoing dialogue revisited and updated many of the major ideas contained in Kunstler's body of work, while exploring many additional topics as well. The KunstlerCast book presents the best of those conversations in a highly readable, organized, indexed form. The book will be released in November. But there's a book party Tuesday at Daisy Baker's in Troy -- both Duncan and Kunstler will be there to sign books. The party starts at 5:30 pm. Thanks so much for the plug AOA! During the party, Kunstler and I will give a very brief blab about the revitalization of Troy as well. Hope you can make it.